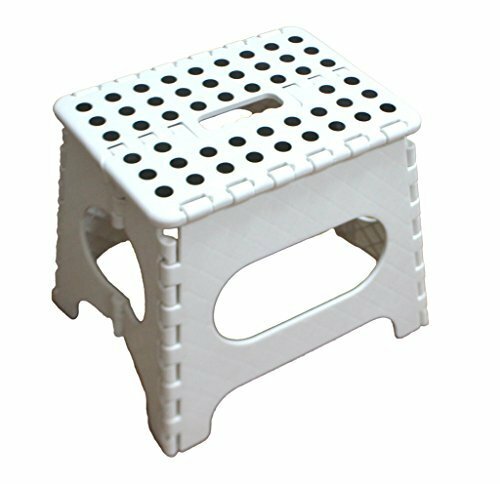 Jeronic 11 Inches Folding Stool for Adults and Kids, White Kitchen Stools, Garden Stool, holds up to 200 LBS is made of high quality plastic which can carry up to 200 pound. Therefore, not only it is wonderful for kids, but it is great and ideal for adults less than 200 pound too. It is fold-able! that allows you to store it when not in use. It also has a durable handle in order to carry the portable stool wherever you go. This feature makes it the best kids stool for your children. Brand:Jeronic. It is normal stool, can not be used as the Step Stool. Great folding stool for in the kitchen, bathroom, RV's and more. Foldable stool opens with one flip of the hand. Handle for easy carrying, Approximately Assembly Dimension: 11" (L) x 9" (W) x 11'(H). Adult Stool holds up to 200 lbs, It is normal stool, can not be used as the Step Stool. If you have any questions about this product by Jeronic, contact us by completing and submitting the form below. If you are looking for a specif part number, please include it with your message.